Version 5.1.4 of Default Folder X is out, and although this update doesn’t bring any big feature additions, it offers a bunch of internal improvements that make things more reliable. If you’re already using Default Folder X, just select “Check for Updates” from the Default Folder X menu in your menubar to get the new version. And if you’ve experienced a crash in Default Folder X and submitted a crash log after it happened, thank you for taking the time to do so. That data really does help track down problems and get them fixed! If you’re having a problem that doesn’t result in a crash, contact us using the Tech Support page and we’ll do our best to get the issue resolved, whatever it happens to be. Use Default Folder X – take off the mittens! Anyway – check it out – along with lots of other great information and commentary – at the 1:20 mark of Mac Geek Gab 647. I think I learn something new in every episode. You can find more details and download links on the App Tamer Release page. We recommend that all App Tamer users update even if you don’t use Spotify because the bug fixes are important. And on the topic of App Tamer, I was remiss in my duties – I didn’t blog about the release of version 2.3, even though it delivered a couple of very significant changes. The most obvious one is a user interface overhaul that brings App Tamer up to snuff with the flat, white look that’s all the rage (check it out over on the right there). The preferences have also been split among multiple tabs to better organize them, and hopefully make all the settings a little less intimidating. A more interesting, though much less visible addition is App Tamer’s new “CPU hog detection” feature. 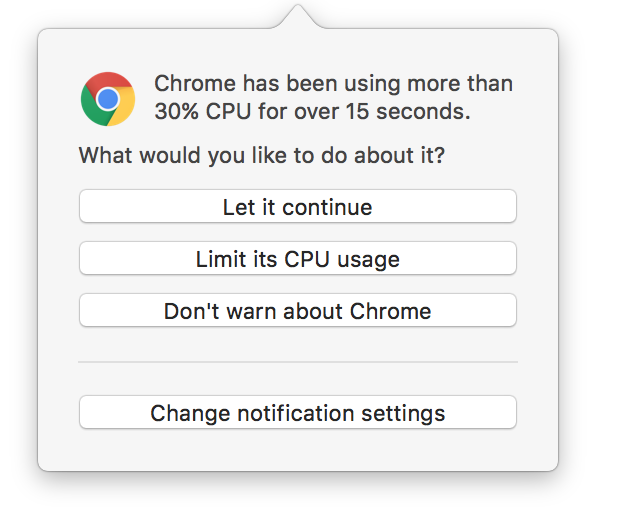 In the “Detection” tab of the preferences, you can set a limit to how much CPU any application should use. 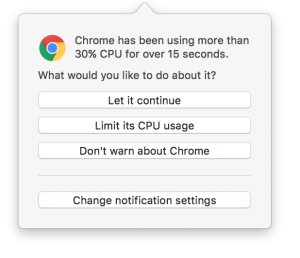 If any app uses that much CPU for longer than a time you specify, App Tamer will pop up a warning to let you know that something’s amiss, and will give you several options. 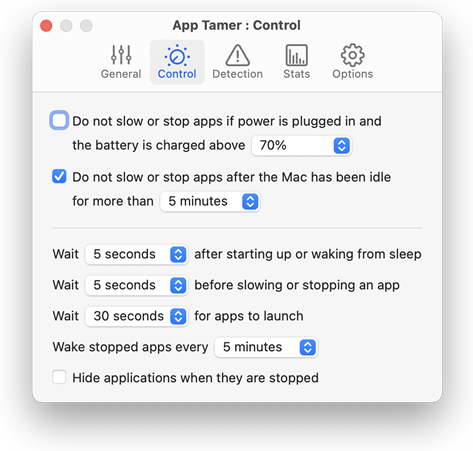 If you’re on a laptop, this is great because it lets you know before the CPU hogging app drains your battery down to nothing and you realize that you left your power adapter under the couch at home. And of course there are a whole bunch of little fixes and improvements rolled into versions 2.3 and 2.3.1 as well. It’s worth the trouble to download, especially if you’ve already bought a license for App Tamer 2 because these updates are free.